In the recent era, they have barely left a smudge on the consciousness of World Cup finals, but if the penultimate friendly before Russia 2018 told us one thing, it was that Gareth Southgate is an England manager prepared to attack the greatest tournament in sport. 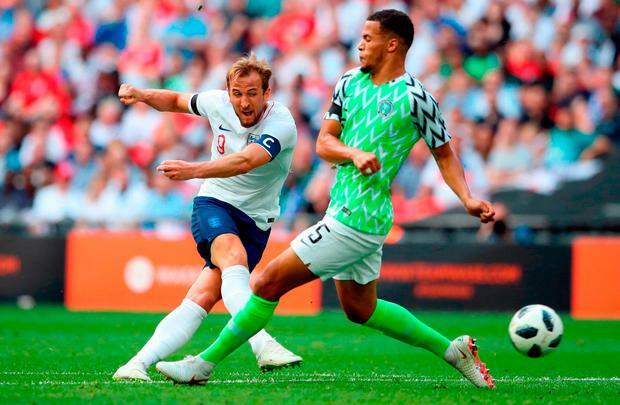 This was a performance of ambition that took England into a two-goal half-time lead and saw them stretched more after the break once Nigeria had got the measure of the 3-5-2 formation Southgate had chosen that committed many more to attack than defence. It will be more the first half than the second that Southgate hopes he will see in Russia, one in which Jesse Lingard and Dele Alli had two of their better games in midfield, and Harry Kane and Raheem Sterling were given licence to attack as a partnership. There was an opening goal from Gary Cahill and Kane followed with a second before half-time, as things clicked for England in midfield. Southgate selected Jordan Pickford in goal and gave the Everton man the full 90 minutes, indicating that it is he who is lead candidate to be England's No 1 when they begin their World Cup against Tunisia in Volgograd on June 18. There will be more clues at Elland Road on Thursday when the final friendly, against Costa Rica, gives the manager a chance to finesse this team and add those Liverpool players who have been absent so far but the basic idea is clear. There is a commitment to possession and the attacking qualities in his squad with just one holding midfielder in Eric Dier and a premium placed on moving the ball forward fast, which England did with aplomb in the first half. 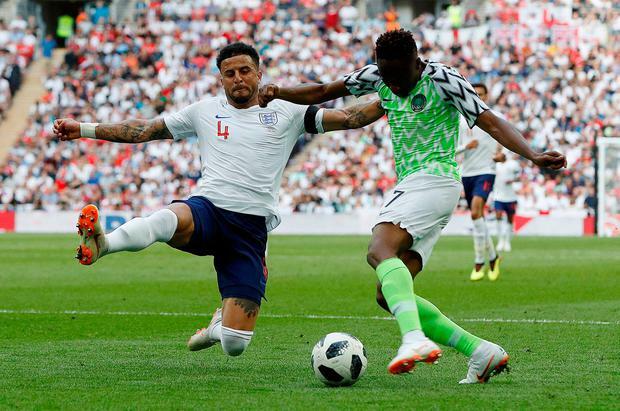 A goal for Nigeria from Arsenal's Alex Iwobi at the start of the second half meant that it was more difficult after the break when there was also a yellow card for Sterling for diving. 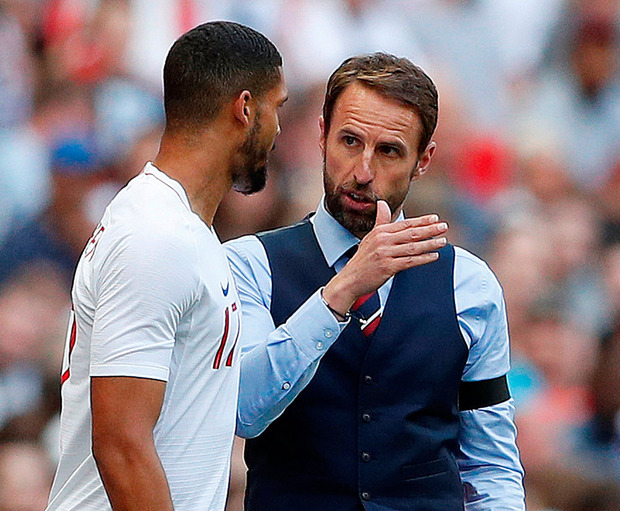 But when he went in at half-time Southgate will have known at the very least that he had a formation that was working and, better yet, a group of players who felt like the right men in the right positions. Not since his very first game in charge of the England team, against Malta on October 8, 2016, had they been two goals up at half-time and it was hard to remember a time when his side had looked more cohesive. The Super Eagles of Nigeria were, it should be said, not exactly soaring early on and there was more than one occasion when a pass in midfield and its intended recipient looked so far off as to make you wonder what the idea was in the first place. But that was partly about the home side's midfield sweat, where they pressed relentlessly and forced the mistake that led to their second goal. England finished the first half with 65 per cent of the possession but it was more what they did with in that period that gave cause for hope. They showed in March against Italy and Holland that they could keep the ball but struggled at times to move it rapidly. This time they moved it forward crisply and quickly and the opposition struggled to contain them. The first goal was a fine header from Cahill, the fifth of his 59-cap career, and a connection so solid that it was past goalkeeper Francis Uzoho in an instant. Moments before Uzoho had pushed a free-kick from Kieran Trippier around a post and it was the Spurs man who delivered the ball on to the head of Cahill. Both Trippier and Ashley Young in the other wing-back position pushed up and supported the running from midfield of Alli and Lingard. There were chances too for Sterling, effectively a partner for Kane in attack, but the former lacked that edge in front of goal that he has had at Manchester City this season. The difference was that England were creating more chances than they have in recent games. 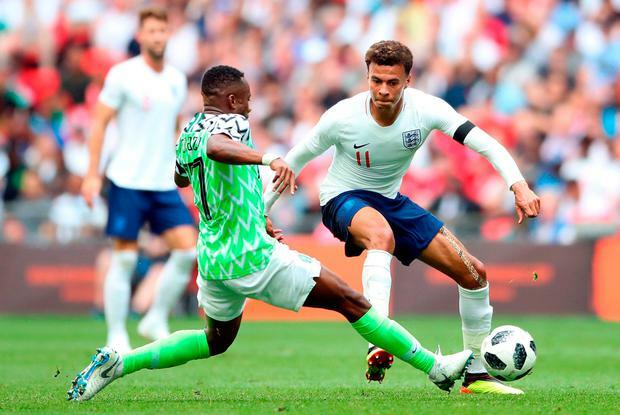 There were boos for Alli from the Nigeria fans for choosing to play for the country of his birth rather than that of his father He was having the kind of game that suggested Southgate has found the right position for him and you felt that if a goalscoring opportunity came his way he looked in the mood to take it. The second goal was a fine piece of plundering, with England turning the possession over in midfield rapidly and moving it from Dier to Kane to Sterling and back to Kane. His shot was classic Kane opportunism, one touch to move it away from his body and a shot quickly struck - albeit by no means unstoppable. Uzoho let it straight under his body. After the break, England did not have the dominance of the ball they had enjoyed in the first half and the early goal from Iwobi gave the visitors the confidence they had been lacking. Nigeria had struggled before then to get their better players like Odion Ighalo, once of Watford, and Chelsea's Victor Moses into the game. It was Ighalo who held off Kyle Walker on 47 minutes and struck a post with a shot from Iwobi's neat pass. The Arsenal man ran on to the rebound, doing well to thread it in past Pickford. Nigeria's German manager Gernot Rohr had made four changes at half-time. They had much better shape about them after that. Southgate was slower to make the changes, eventually bringing on Marcus Rashford and Danny Welbeck for Kane and Sterling. It had been a forgettable second half for Sterling who chased one ball into the penalty area and went down with a lamentable dive as Uzoho approached. The striker was rightly booked, although Sterling was not the only Englishman whose intensity had flagged after the break. Natalie Whitmore A young Chelsea fan was left "ecstatic" after an impromptu kickabout with Brazilian star Willian during a visit to Stamford Bridge.